The 69th Artillery, C.A.C. was formed in May of 1918 from the Coast Defenses of Puget Sound, Washington at Ft. Worden. In August of 1918 the Regiment was moved to Camp Mills, NY in preparation to sailing to France. On August 15, 1918 the Regiment moved to Port of Embarkation Philadelphia and sailed aboard the Colier USS Jason, but there was not room for all the officers aboard the Jason and 34 of the officers of the 69th Artillery were assigned to the SS Demosthenes which was sailing from Quebec, Canada on August 17, 1918. The 34 officers had to get up to Quebec from Philadelphia in two days time in order to make the sailing of the SS Demosthenes. The Jason with Colonel Robert F. Woods and the bulk of the 69th Artillery arrived in France on August 31 and the SS Demosthenes with the Lt. Colonel Edward W. Turner and the other officers arrived two days later. While in France the 69th was stationed at O&T Center No. 1 (Operations and Training), Libourne, France. The 69th was one regiment of the 36th Brigade C.A.C. The Regiment was assigned to the American 5-inch Seacoast Gun. These guns were removed from fixed emplacements in the United States and placed on special mobile mounts for use in France. Twenty-six of these units had been assembled and sent to France. The regiment trained five months in Libourne with the new 5-inch seacoast guns, for which they had no ammunition, and did not get to the Front at all. The Regiment left Bordeaux, France on February 4, 1919 aboard the USS Mercury and arrived at Newport News, VA on February 18, 1919 and went to Camp Stuart and then to and Camp Eustis, Virginia where they were demobilized. In the five and six-inch Seacoast guns that could be spaired from the Coast Artillery and the reserve store of the Navy, there was shell power that might quickly be made available for the western front. When the United States entered the war the Ordnance Department at once set out to master the problem of placing these heavy fixed emplacement pieces on mobile field Mounts. An inventory showed that ninety-five six-inch and twenty-eight 5-inch guns could be secured from the Coast Artillery and forty-six 6-inch guns from the Navy, while an additional 30 guns of the six-inch size were offered by a private dealer in this country. Minor alterations were necessary in many of the guns to make them adaptable to field mounts, and the Navy guns, ranging from 30 to 50 calibers in length, had to be cut down to a uniform length of 30 calibers. The long six-inch seacoast guns were not shortened because it was planned to return them to the Coast Defenses from which they were taken. Speed in the manufacture of the Carriages for these guns demanded that they be of the simplest design consistent with the great strength necessary to bear the weight of this fixed emplacement material. The carriage designed for the five and six-inch naval guns having been placed under test and found to meet all requirements by September of 1917 and orders were placed for ninety-two 6-inch Carriages and twenty-eight 5-inch Carriages. Owing to the great weight of the long six-inch seacoast guns, however it was found at that it would be necessary to carry them separately on big transport wagons. Such a wagon was designed and an order placed for 55 wagons in February of 1918. When the Armistice was signed practically all of these mounts had been completed. Seventy-two entirely assembled six-inch units and twenty-six; five-inch units had been shipped for overseas duty. As I find information on men who were in the 69th Artillery I will list them on the Regimental Muster page. This page is devoted to telling the stories and history of the men who served in the 69th Artillery during WWI. If you have family members or know of someone who served in the 69th please e-mail me and I will add them to this page. Captain Harold H. Hilton returned to New York City on January 12, 1919 on board the USACT Abangarez that left Bassens Dock, Bordeaux, France on December 29, 1918. Captain	Hilton was under orders for duty at Fort Monroe, Virginia and sailed home before the 69th Artillery sailed in February. Captain Hilton listed his wife Jewell Bell Hilton as the person to contact in case of an emergency on the passenger manifest of the Abangarez. 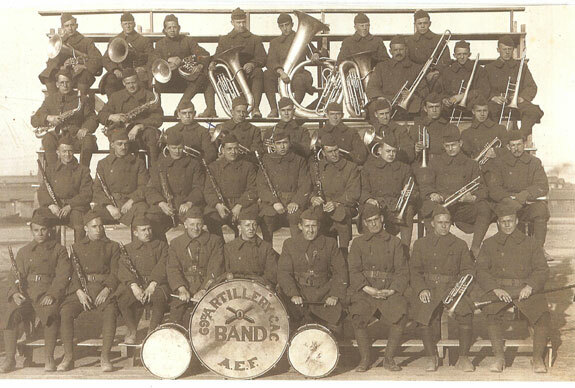 Photo of the 69th Artillery Band taken after thier return from France. Wayne L. Poland is the 5th man from the left in the second row. Photo of Bandsmen Poland taken while the 69th was in France. 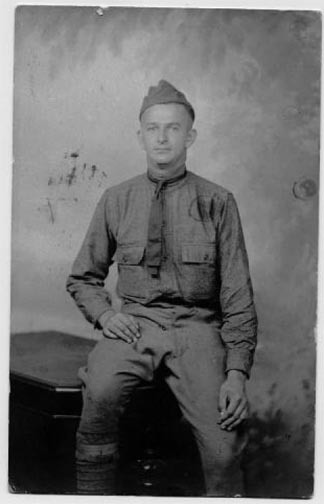 Another photo of Wayne L. Poland taken in 1917 before he went to France. Pvt. Harry Hurst, Battery C, 69th Artillery, CAC, WWI. Pvt. Calvin S. Rowan, 435707, Battery D. Pvt. 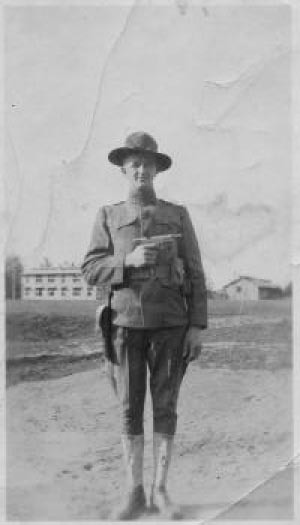 Rowan was 23 years old when he enlisted into the National Army at Lebanon, Ohio on 12 March 1918. Rowan was an Ohio native and lived at the time at 35 Allen St. in Franklin Ohio which, was his city of birth. 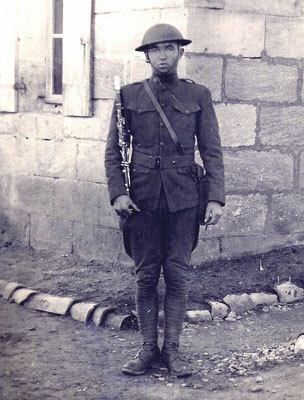 from his enlistment until 2 April 1918 he was stationed in the Coast Defenses of the Columbia at Ft. Stevens, Oregon. 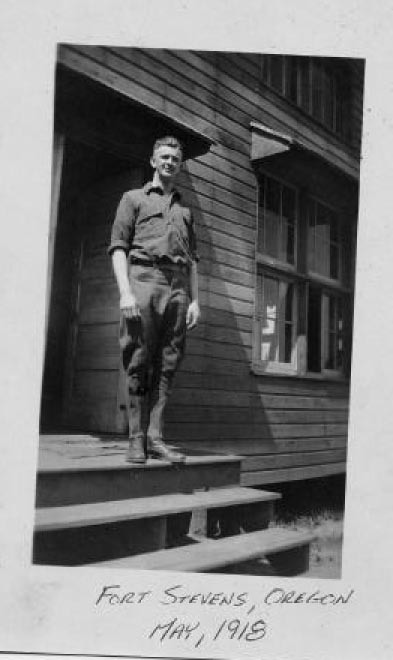 From 2 April to 24 May 1918 he was with the 21st Company at Ft. Canby, Washington. During May of 1918 the 69th Artillery was being formed and on the 24th of May he was formed into Battery D of the 69th Artillery. Pvt. 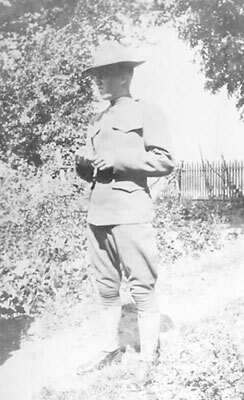 Rowan sailed with the 69th Artillery to France and returned with the 69th and was Honorable Discharged on 10 March 1919. PFC Frank Schumann 834646: Vince Cooper contacted me in June 2002 about the 69th Regiment in which his grandfather was a member of. The information Vince had given me about his grandfather and the 69th Regiment is what I have used to put together the history of the regiment. Vince supplied the photos of his grandfather and also confirmed the information I was able to put together on the regiment. Like many young boys who admired their grandfathers, I often wondered what my Grandfather did in the Great War. My Grandfather, PFC Frank Schumann 834646, enlisted in the U.S. Army on 02 April 1918 in Horicon, Wisconsin and was initially assigned to the 3rd Company of the 69th Artillery, C.A.C in May 1918. My Grandfather�s last duty assignment was with Battery D, 69th Heavy Artillery Regiment, 36th C.A.C. Brigade. The following is a short history of the 69th Artillery Regiment with an emphasis on it's formation and service during World War One. The specific 1918 and 1919 dates reflect those dates from my Pvt. Schumann's military personnel files and discharge papers. The 69th Artillery Regiment of the Coast Artillery Corps (C.A.C) was initially formed on 17 May 1918 from men serving with various units of the Coast Defenses of Puget Sound headquartered at Fort Worden, Washington. The 69th was designated as a Heavy Artillery Regiment, and was comprised of the 1st, 2nd, and 3rd Companies based at Fort Stevens, Oregon. The role of 69th was to provide protection to the entrances of the Columbia River as part of the harbor defenses of the Columbia. In August 1918 the 69th Regiment was moved to Camp Mills, New York and prepared to sail for France. On 15 August 1918 the Regiment sailed from Port of Embarkation Philadelphia, Pennsylvania. After more than two weeks at sea, the Regiment disembarked at St. Nazarre, France on 31 August 1918. The Regiment trained at the Operation and Training Center (O & T) No. 1 located near Libourne, France. The firing range used by O & T Center No. 1 was at Camp de Sourge, France. The Regiment was attached to the 36th C.A.C. Brigade, which also included the 63rd and 68th Regiments. The 69th Regiment was equipped with 5-inch American Seacoast guns that had been removed from the coast defenses of the United States. These guns, which had previously been used as stationary artillery pieces, were fitted with specially designed mobile mounts, and shipped to France. The 69th was the only C.A.C. regiment to receive this type of artillery piece. Although the 69th Regiment was fully trained, equipped, and ready to take its place in the line, the Armistice was signed before the Regiment was able to see active service. On 03 February 1919, the regiment embarked for the United States where it arrived on 18 February 1919. The Regiment was then demobilized at Camp Eustis, Virginia. After demobilization Pvt. Schumann was mustered out of the Army at Camp Grant, Illinois. The 69th Air Defense Artillery Group has served in time of threat and danger since May 17, 1918. It was originally designated the 69th Regiment (AA) Coast Artillery Corps, when activated at Fort Worden, Washington. The 69th Coast Artillery Regiment (AA) was located at Fort Crockett, Texas as part of the defense of the Galveston Bay area just prior to World War II. The Regiment then moved to Camp Hulen, Texas, during the limited emergency before World War II and was located there at the time of the bombing of Pearl Harbor. The Regiment then moved to become part of the Air Defense of San Diego, Calif., in the early part of World War II. There it was re-designated the 69th Artillery Group. The Group subsequently went to the Pacific Theater to participate in the Saipan Operation. The 69th Artillery Group was awarded the Meritorious Unit Commendation for its participation in the Western Pacific Campaign. On June 5, 1948, at Saipan, the Group was inactivated. In 1955, the Group was again called to active duty as the 69th Anti-Aircraft Artillery Group at Karlsruhe, Germany for two and one-half years. On April 1, 1960 at Wurzburg, Germany, the 69th Artillery Group became the first HAWK missile unit in the U.S. Army. Currently, the 69th Air Defense Artillery Brigade, V CORPS is located in Giebelstadt, Germany with battalions in Ansbach, Hanau, and Kaiserslautern. It is the only forward deployed Air Defense Artillery Brigade in the U.S. Army. We deployed in December 1990, not 1989. We were also the first and only Patriot battalion to follow VII Corps into Iraq during the war (my unit followed 1st Infantry Division thru lane echo...with the British). I was an infantryman assigned to do their recon (RSOP). In December of 1990, the 69th Air Defense Artillery Brigade, in conjunction with elements of the 32nd Army Air Defense Command, deployed a task force of over 1000 soldiers in support of Operation Desert Shield / Desert Storm. As the dedicated high and medium altitude air defense asset of the US Army VII Corps, Task Force 8-43 fielded four Patriot Missile batteries and two HAWK batteries. The task force provided critical protection to the VII Corps as it executed a classic flanking action and raced across Iraq. At the conclusion of the war, Task Force 8-43 was deployed well forward on the battlefield, providing integrated coverage against both hostile aircraft and ballistic missile threats. The 69th Air Defense Artillery Brigade is presently deployed at Glebelstadt Army Airfield, Germany as part of the US Army's NATO contingent in Europe.